As I reported in June the developers had requested the Mayor take responsibility for deciding their application to build a hotel on Falcon Road. The Mayor has decided that he is content with Wandsworth Council taking the decision, meaning the council’s refusal of the application stands. Legally, the Mayor has powers to determine applications if they are strategically important enough. 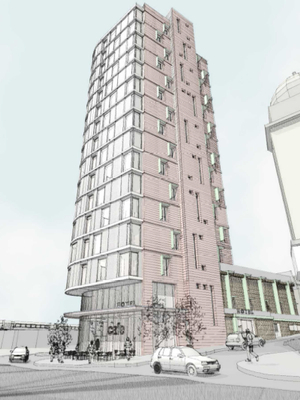 When the council’s planning department recommended refusal of the application to councillors the developers turned to the Mayor, claiming their hotel was of such importance he should be the decision maker. There is a three step test the Mayor must apply: first, that the application has a significant impact on the implementation of the London plan; second, that there are significant effects on more than one borough; and third, that there are sound planning reasons for intervening. His decision was that the hotel failed on all three tests! The developer can still appeal to the Planning Inspectorate – which is the last option remaining to them. If they do, all objections made to the council will be carried forward. That’s that then! I wonder what will become of the office block now. I’d just like to point out that the block is, of course, in Battersea, NOT Clapham. But it might not be the end of it. The developer can still appeal (although I would imagine the chances of a successful appeal are slim) and, of course, they can return with new plans. My guess is the latter, both the Mayor and Council felt it wasn’t a quality application which is a view I imagine the Planning Inspectorate would share. It’s in the developers’ hands though – we just have to wait and see what they do.